Valencia CF began last season viewing a Europa League qualification as a good season. After finishing 12th in consecutive seasons and going through five coaches in that same time frame, Els Taronges fans could be forgiven for expecting little of their team. That changed within a few months, as they went on a run that saw them suddenly appear to be title contenders. Of course, the long-term goal was always a return to the Champions League, but not even their most enthusiastic fans could have predicted such a swift return to excellence under new coach Marcelino García Toral. By the time they faced FC Barcelona in late November, they were fresh off their eighth straight league win – a run that saw them score 28 goals. Led by a ruthless attack consisting of Rodrigo Moreno, Simone Zaza, Carlos Soler and the magical Gonçalo Guedes, they were beating every team in sight and scoring for fun. 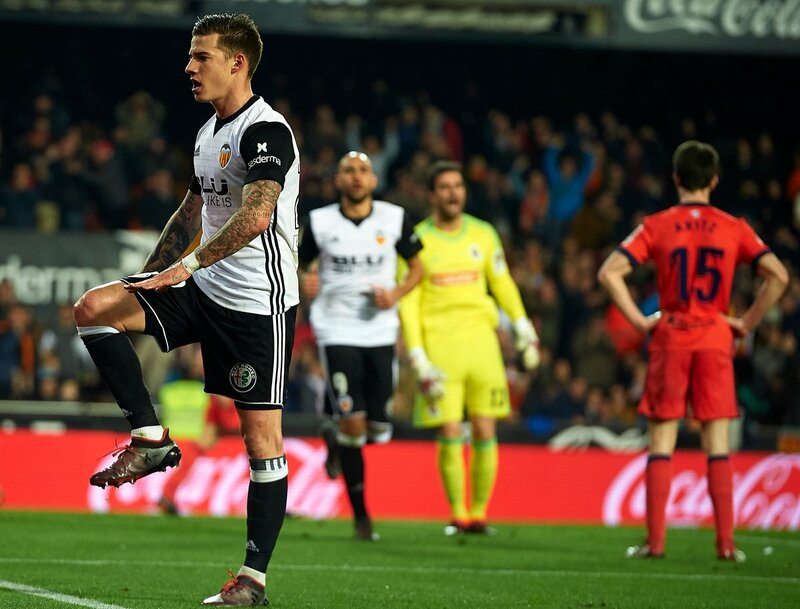 Off the bench, Santi Mina was chipping in goals as well, as the team ran through a difficult run of games with ease; the 6-3 win away at Betis and the 4-0 win over Sevilla seven days later properly encapsulated the kind of run they were on. It was so good that the game against FC Barcelona was a top-of-the-table clash. Los Che were also unbeaten in the league at that point; solely dropping points against Real Madrid, Atlético Madrid and city rivals Levante. Marcelino had worked wonders with a squad that was still recovering from two consecutive relegation battles. As crazy as it sounds, that top-of-the-table clash was just a year ago, on November 26. In truth, it feels like decade ago. By this time last year, Valencia were gunning for the top spot in La Liga. Today, they are 15th. They have won just two league games all season – none at Mestalla. By this time last year, they had scored 30 goals already – a tally only bettered by FC Barcelona at the time. Currently, they have the worst attack in La Liga, statistically. Having scored merely eight goals, they are the joint-second worst attacking team in Europe’s top five leagues. The only team with a worse attacking record is Huddersfield, who have scored just six. Valencia CF have drawn eight of their 12 league games this season, and also drawn two of their four Champions League games. Interestingly, they have the joint-second best defence in La Liga, statistically, and one of the best in Europe’s top five leagues. Only Atlético Madrid, Manchester City, Liverpool, Chelsea, Montpellier, Juventus, and Paris Saint Germain have conceded fewer. So what really is the problem of Valencia CF in 2018/2019? What has changed within the past year? Why are they suddenly struggling to win games? Why are they struggling to score goals? The answer is not as simple as many might think. The first problem was initially their inability to create chances. Guedes was their best creator last season, racking up nine assists in the league. Unfortunately, it took all summer to get him signed on a permanent transfer, and as such, he missed pre-season with the team, arriving just before deadline day in late August. Although he arrived late – on loan – last year as well, at the stroke of deadline, he had participated in a full pre-season with his parent club at the time. Marcelino slowly introduced him off the bench and and he quickly earned himself a place in the side, adapting incredibly fast. This year, however, he spent his summer at the World Cup and barely had any pre-season. What little pre-season he had was spent unsettled, going back and forth with the PSG hierarchy over his wish to join Valencia. He eventually arrived at his new club rusty from the lack of physical preparation, and spent a longer time easing his way in. Just when he was approaching full fitness, he suffered a left adductor injury, and was forced to spend three weeks on the sidelines. Simply put, Valencia do not have another player in their squad who can provide what Guedes offers. He is their x-factor, their best creator and the most reliable attacker in 1v1 situations. His movement on and off the ball, as well as his excellent combinations with José Luis Gayà open up a plenty of avenues for the team to attack through. Without him, their play becomes largely predictable, dry, and stagnant. The statistics agree, too. In the three games that Guedes has started this season (discarding the start against Barcelona which lasted 12 minutes before he succumbed to injury), Valencia have created 11 big chances. In the remaining nine games, they have created a total of 16 big chances. He has been closer to 100 percent in the last two games against Girona and Getafe; a total of 10 big chances were created in those two games. His importance to the side cannot be overemphasised. It is no coincidence that his return from injury has led to an increased spark in attack for Los Che. The previous point brings us to the next one: Valencia have created 27 big chances this season; the fifth best tally in the league. However, they have scored just eight goals; the worst in the league. The chief culprits have been Kevin Gameiro (six misses) and Rodrigo (eight misses). Both men have scored a combined total of two goals so far this season, but that tally could easily have been 14. The club has the fourth highest number of big chances missed in La Liga so far – 20. Also, two of their eight goals have been penalties, while one has come from a corner, meaning they have scored just five goals from open play so far in the league. Two of their eight goals have come from defenders, while another two have come from Dani Parejo, the main penalty taker. Between their two summer arrivals (Gameiro and Michy Batshuayi), as well as ex-Real Madrid target Rodrigo, once rated at €120m this summer, Valencia’s strikers have amassed three goals in La Liga this season. The last attacking problem lies in winning duels, and, by an extension, creating space for Rodrigo to operate in. Before Santi Mina’s return from injury, Valencia were struggling to win aerial duels in attack, and Rodrigo was struggling to combine well with both Batshuayi and Gameiro. Competing for and winning duels is a key part of Marcelino’s game-plan. It leads to the increased likelihood of winning second balls, which can then be used to spring attacks at breakneck speed. Last season, Valencia had Simone Zaza competing for 2.3 duels per game. The best before Santi Mina’s return was 1.0 per game by Batshuayi. That gap has taken a toll on Valencia’s attacking strategy, and although they eagerly shipped him out for Gameiro and Batshuayi, Zaza’s physical presence has been sorely missed this season. The Italian’s influence in attack was also felt in how well he combined with Rodrigo and created space for him, often dominating aerial duels and giving his teammates a chance to pounce on goal. Santi Mina is the closest replacement Valencia have in replacing Zaza’s importance; since returning from injury, Santi Mina has competed for 1.8 duels per game – not quite Zaza’s level, but still much better than before the injury. Regarding Rodrigo’s issues with Gameiro and Batshuayi, the simple summary is this: Batshuayi and Gameiro are more focused on boosting their goal tallies, no matter what, than working well with Rodrigo. All three strikers are now operating for themselves. They barely square it to one another, and they keep getting mad at one another on the pitch. Santi Mina and Zaza were the complete opposite last season. They were more interested in doing the selfless, unheralded work for the team, allowing for the side to click on all cylinders. Since Santi Mina’s return, Rodrigo has received more space to operate and, as a result, gotten more chances to score. Nothing beats having players who are already in tune with the system. The good news for Valencia is that everything is starting to come together, to a certain degree at least. Guedes and Santi Mina are back in the side, fully. The team looks more lively in attack, and Marcelino’s game plan is starting to click again. All that is left at this point is for the attacking players (especially the strikers) to start taking their chances. Once they become more clinical, Valencia’s draws will become wins, and all will be well at Camp Marcelino again. That is, if they starting taking their chances.